Nitrogen vs. Air: Which One Should You Use to Fill Your Tires? As a diligent car owner, you check your car’s tire pressures to make sure they are properly inflated. If they are not, you either use an air pump, or go to the gas station and spend a few bucks to fill your tires with air. Did you know that the air used to fill your tires is comprised of 78% Nitrogen and 21% Oxygen? As a result, moisture tends to build up in your tires. Recently, people have been using nitrogen to fill their tires to reduce the effects of the moisture buildup. Let’s take a closer look and see if it’s worthwhile. Nitrogen is one of the most abundant gases on earth and in the universe. Discovered by Daniel Rutherford and others in the 18th century, nitrogen atoms are one of the most stable elements in our atmosphere. These atoms tend to combine with each other and form N2. 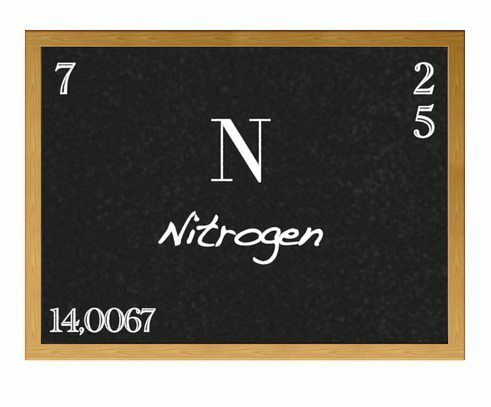 The N2 combination of nitrogen is common and tends to be very strong. Unlike oxygen, nitrogen is a stable and less reactive substance and considered to be a dry gas. Since nitrogen is a dry gas, it is less susceptible to moisture buildup in tires. From far away, a tire looks like a solid piece of material. However, if you take a closer look with a microscope, you will see strings of rubber with holes. These holes are big enough to attract oxygen and moisture, which tend to corrode the metal components of the tire. Filling your tires with nitrogen will keep the moisture out and lessen this impact. In addition to its qualities as a dry gas, tires filled with nitrogen tend to lose pressure less quickly than those filled with air. As a result, your tire pressures will end up remaining the same for a longer period of time. Even though this may mean fewer fill ups, you will still need to do periodic pressure checks on your tires. Filling tires with nitrogen can be useful for applications such as race cars and airplanes. These applications rely on nitrogen to have predictable air pressures, which is not possible with air-filled tires, as a result of varying moisture content. One of the major drawbacks to filling your tires with nitrogen is the cost and lack of convenience. In general, air is readily available at your nearest gas station or at home. If you fill your tires with air, you can do check and fill your tires at the same time. On the other hand, if you fill your tires with nitrogen air, you will most likely have to go to a service station. If it is your first time filling your tires with air, the technician will have to deflate your tires and pump nitrogen into them. This process may have to be repeated until the nitrogen content in your tires is at least 93-95%. Since machinery is required to separate oxygen and other gases from nitrogen, the service centers that offer nitrogen may charge anywhere from $5-30 per tire. A full nitrogen upgrade for all your tires could cost hundreds of dollars! In contrast to filling your tires with nitrogen, filling with air only costs a few dollars. At many gas stations, you can buy a few minutes of air for just 75 cents. Nitrogen-filled tires do not save money or enhance safety. According to a study conducted by ExxonMobil, filling your tires with nitrogen does not lower a tire’s rolling resistance or result in any fuel savings. Tires filled with nitrogen also will not show any improvement in performance, like braking and steering. Before filling your tires with nitrogen, see if it is even worthwhile for your needs. One benefit for nitrogen-filled tires is that they lose pressure at a slower rate. However, the difference in pressure between oxygen and nitrogen tires is minuscule. Over the course of a year, Consumer Reports left nitrogen and oxygen-filled tires outside. After 1 year, air-filled tires lost 3.5 psi, while nitrogen-filled ones lost 2.2 psi: a difference of only 1.3 psi. This is less than 10% of the average 32-35 psi for standard tires! Another purported benefit is the fact that nitrogen-filled tires tend to keep moisture out. As a result, the tire’s metal components will not wear out. However the effects of moisture on a tire’s metal components will take a long time to occur. Before then, the tread will wear out, and you will need replacement tires anyways. Filling your tires with nitrogen is an intriguing idea. However, the cost of filling your tires with nitrogen and the uncertain benefits make this idea unnecessary for the vast majority of consumers.